Love me! Help me! – can art save Battersea Power Station? As Chairman of Battersea Power Station Community Group Brian Barnes has fought for the power station for 32 years. The Battersea Power Station has without a doubt a special place in many Londoners hearts. It has this word presence – not many buildings have been featured in popular culture as much as the iconic building based on a river side site next to Thames. Now the power station is facing a massive re-generation scheme led by the Battersea Power Station Development Company, a Malaysian consortium in charge of the ambitious building project. The scheme has stormed critique especially among local residents. 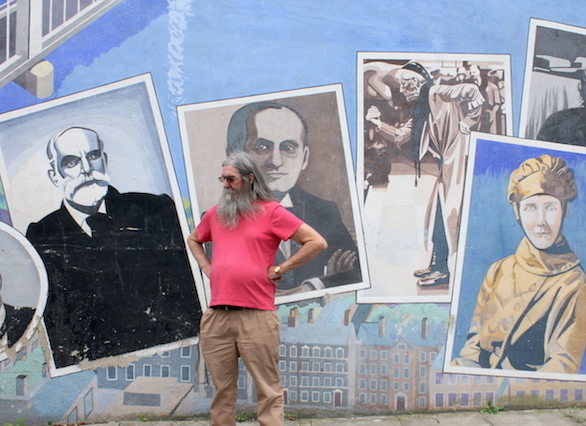 One of them is Brian Barnes, a mural artist who have been the fighting for the Battersea Power Station over three decades. Brian is Chairman of Battersea Power Station Community Group which has been campaigning to save the power station and to inform people about what the local community thinks about the redevelopment plans. 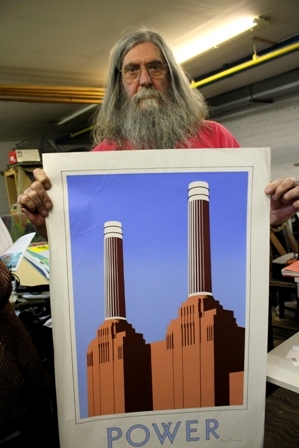 The Battersea Power Station has inspired Brian’s artwork and the posters made by Brian have been part of the Battersea Power Station Community Group’s campaign. One of Brian’s posters represent what Pink Floyd did in 1976. A helium filled 45 long pig was anchored to the chimney for the cover of Pink Floyd’s Animal album. “Battersea Power Station and the pig go together like peaches and cream” Brian says. The iconic rock image Pink Floyd’s inflatable pig Algie has inspired Brian Barnes’ posters. 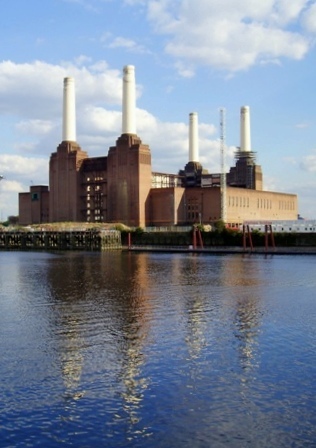 Algie famously flew over Battersea Power Station for Pink Floyd’s “Animals” album cover in 1976. However the pig isn’t the only animal Brian has used in his artwork. Orangutangs have also been a common feature in Brian’s art inspired by the power station. This is because one of the companies that owns the power station, Sime Darby – one of the biggest palm oil producers in the world – is cutting down a rainforest in equatorial zones and destroying the natural habitats of orangutangs. “If they can do that in Borneo and threaten the rainforest and the orangutangs, I don’t think they are going to be much bothered about a building of brick”, Brian adds. “On Valentine’s day we put up a big ‘Love’ banner up on the chimneys with a heart on it. That got everyone interested in loving Battersea Power Station”, Brian says. The 45 foot long banners which the Community Group members strung up between the chimneys have also said ‘Love me’ and ‘Help me’. Brian believes that art helps to galvanise people’s attention to the power station and what’s going on: “Whether the chimneys are coming down or whether there is too much luxury housing around it or whether the tube station is really going to be useful for the local people”. A mural ‘Battersea in perspective’ was made in 1988. 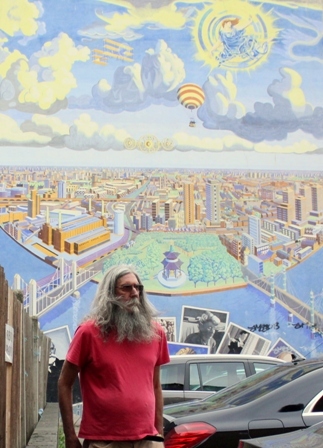 The mural including Battersea Power Station ‘is all about the Battersea area and people who are famous of being Battersea residents’ Brian says. “Battersea Power Station missed out being an art gallery because it didn’t have a roof” Brian says referring to the Bankside power station which now serves as the Tate Modern. 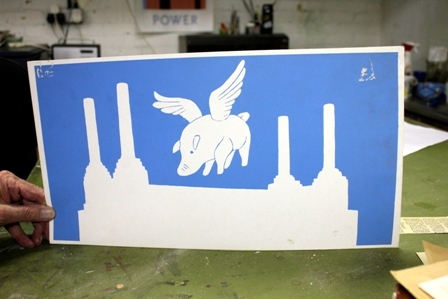 The chimneys of the Battersea Power Station have been a significant part of Brian’s art. “If all the chimneys are down and the present Battersea Power Station Development Company leaves then you would have a box of brick with no chimneys”, Brian worries. At the moment the chimneys are indeed going down in order to be rebuild. Perhaps art cannot save the Battersea Power Station. However it has spread the message of what is happening and helped social change by being a part of a wider campaign. “I used it (Battersea Power Station) as an image to represent Battersea”, Brian says and what is sure is that his campaign to save the power station isn’t over yet. Spectacle offers several training courses in which participants can experience all the aspects of filmmaking. Recently I participated in Spectacle’s four day Digital Filmmaking training course which I did as a part of my one month work placement for Spectacle. These intense four days gave me what I was looking for – a practical skill set in filmmaking and post production. As an undergraduate Politics & Media students at Bournemouth University, the training course provided me with practical tips how to produce a short film and what I need to know beforehand which will without a doubt benefit my studies. During the training course the other participants and I had a chance to practice all aspects of filmmaking: everyone had a go with camera, sound, interviewing and directing. A practical exercise was an interview with a local Mural artist Brian Barnes who talked about his art inspired by the Battersea Power Station. Dominique Lyons, one of the participants describes the training as ‘a good all round course on the basics’. Dominique who works in communications thinks she picked the right course for herself however our participants also came from different fields. Pelagia Makrelli, an anthropology student from Greece, did her Erasmus workplacement for Spectacle this summer. She says the training helps ‘anthropologists to go from theory to action’. Another anthropologist participating the course was Zsuzsa Millei who says she appreciates how the course showed ‘respect for beginners enthusiasm, patience when something went wrong and understanding of clumsiness’. How to film an interview? Spectacle’s training course participants tested interview techniques with a mural artist Brian Barnes. With my previous experience in editing covering the basics of how to use iMovie, the training course shed light on more advanced editing software and broadened my knowledge of different possibilities for editing. We learned how to use Final Cut Pro and we were advised which software might suit our own purposes. Now after the training course I feel a lot more confident with working with cameras and I’m looking forward to use these new skills in practice. A freelance journalist Jessica Holland also found the training course very beneficial and she hopes to use her skills to make short documentaries. After all everyone of us who took part in the training course will use these learned skills in different ways. However I believe the course encouraged us to take the next step and get involved in film projects that we might have missed otherwise. The iconic Battersea Power Station is at the heart of Rafael Vinoly’s master plan – a massive “regeneration” scheme for Battersea. The riverfront district of Southwest London around the Battersea Power Station will soon be unrecognizable due to a huge “regeneration” scheme. The Battersea Power Station which has remained largely unused since its closure in 1983 is at the heart of this luxury housing development financed by a Malaysian real estate investment group Eco World. This regeneration scheme has recently hit the headlines with its culmination London’s first ‘sky pool’, a swimming pool which has been planned to bridge two 10-storey buildings in Embassy Garden’s as a part of the Battersea “redevelopment” plan. The Independent wrote: “Nine Elms ‘sky pool’: luxury London flat owners will be able to swim while literally looking down on everyone else”. In addition, The Guardian stated: “The ‘sky pool’ is just the start: London prepares for a flood of bathing oligarchs”. The planned luxury flats are being criticized for being aimed at wealthy foreign buyers taking advantage of the rising value of property in London. In January 2013 the first residential apartments went on sale and now all of the Thames-facing apartments have already been sold, way before the project was even launched. Last year the reselling cycle made possible that the flats with starting prices from £1 million were on sale later on the year for £1.5 million. However the rapidly increasing prices are only a one side of the issue. The fundamental conflict lies on the fact that only 16 % of the planned new homes (560 of the total of 3,444) will be affordable housing. The “redevelopment” of Battersea would change the Landscape of London – the iconic Power Station would be surrounded by huge building blocks. Since the power station ceased generating electricity in the 80s, it has become one of the best known landmarks in London. As the largest brick building in Europe, the iconic power station was listed on the World Monuments Watch by the World Monuments Fund in 2004. During the past 50 years, numerous redevelopment plans for the Battersea Power Station have been introduced. However these projects have usually failed due to a lack of funding. 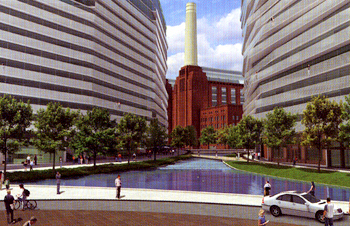 In 2010 Real Estate Opportunities were granted permission to redevelop the power station. This resulted in the creation of the current master plan for Battersea, an architect Rafael Vinoly’s design which gained planning consent from Wandsworth Council in 2011. However, Vinoly does not have exactly a clean architectural record. According to the BBC the ‘Walkie Talkie’ skyscraper on Fenchurch Street in London had been blamed for reflecting light and causing a ‘death ray’ with a high temperature. The 37-storey tower designed by Rafael Vinoly was claimed to damage vehicles by melting parts of them and even causing fires. Last week Building Design magazine announced that Walkie Talkie, nicknamed because of its bulbous, curving shape was voted for the worst building in London. Building Design’s annual Carbuncle Cup sparked an online debate including not so flattering comments about the building such as one reader commenting: “I now have a new personal goal: to live long enough to see this building demolished”. Now the planned Phase 3 with proposals for the future of Battersea and the power station has been revealed by the Battersea Power Station Development Company, a Malaysian consortium in charge of the project. The Phase 3 of the project will provide 1,310 residential homes with only 103 of them being affordable which is less than 8 % of the houses that are planned to be build. Will this solve the growing divide in the London housing market? Very unlikely. So far it seems that the beneficiaries are the wealthy few who the housing crisis doesn’t hit with its sky-high prices. See our Battersea Power Station project pages for more information and videos.